In 1932 the German Agfa company had a new idea for an advertising campaign. German coins had a letter imprinted that indicated the place of minting. Customers should collect four single 1-Mark coins with the letters "A", "G", "F" and "A". With this money in hands money they could avail a special offer of Agfa: the new Box 44. Most box cameras were quite simple. So was the Box 44. But four marks were still a dumping price. The camera was nicknamed "Preisbox". The loss that Agfa made by selling the cameras so cheap was more than compensated with the following sales of Agfa film rolls. The camera was produced from 1933 to 1938 and was a huge success. It helped to popularize photography widely. 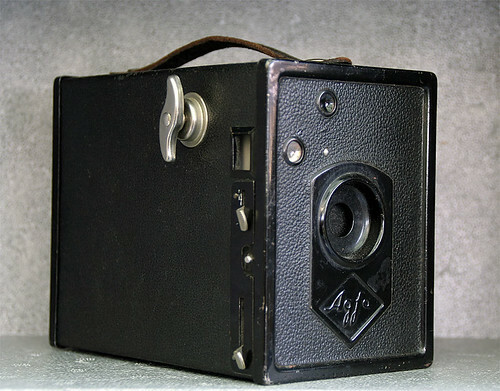 In the 1950s that popularity was revived, again with an Agfa box, the succeeding model Agfa Box 50.